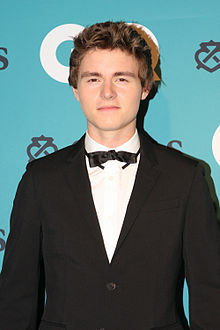 Callan Ryan Claude McAuliffe (born 24 January 1995) is an Australian actor, known for his roles as Bryce Loski in Flipped and Sam Goode in I Am Number Four. He appeared as young Jay Gatsby in the 2013 film The Great Gatsby. As of 2017, he appears on The Walking Dead as Alden. I find that you learn from others. It's very much about watching TV and watching movies for me and grasping that way and watching other people act. I've always had a natural affiliation with nature. If I wasn't an actor, I'd be some sort of biologist working in the field in Africa or something. You know, every country needs another country to mock, and Australians seem to be pretty good at impersonating American people. Maybe it's because all the movies and music and TV you see there is from America, so we just have the knack for it. I do chores around the house, but I don't get an allowance for them. I wash the dishes and sweep the floor... I'm sweeping the floor quite a lot, and my mum always expects me to get a broom and swagger it across the floor all the time. I wasn't really geeky. In terms of the high school hierarchy, I was very much in the middle ground. You have the really popular guys, you have the nerdy guys, and then you have the people who really don't care - and that was me. I wasn't really picked on or anything like that. I've never been a really big fan of theatre. I don't know why. It's so much for effort. It's much more difficult for me than stage acting just because of the pressure that's piled on you and you have to learn the entire performance by heart. I want to be able to have a conversation with people. I don't want to be stupid. I'd like to have a life outside acting. The Australian accent is sort of like going down a step in smartness, you could say, because you guys pronounce things as they're spelled. We add and abbreviate stuff. I'm not a big texter anyway. I'm really slow at it and so I try to avoid it to avoid embarrassment, you know what I mean? 'I Am Number Four' definitely borrows from a whole bunch of genres and has a whole bunch of different themes throughout. And I think if it was just one stale two-dimensional thing then it would be kind of boring. And I think they did a fantastic job.